The pristine 2003 Indian Spirit Roadmaster for Sale currently has only Only 13k miles on it! You won't find a better, used Indian for sale on Craigslist or in an Ebay auction so hurry and make an offer before it gets away from you! 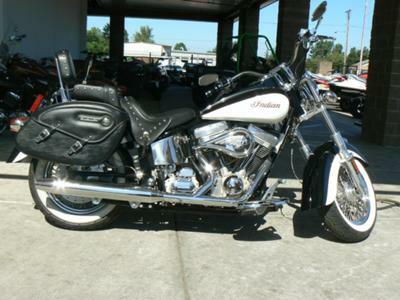 This Indian is in pristine used condition! The bike is near perfect showroom condition! GoGoCycles would also encourage bikers to write a review of the 2003 Indian Spirit Roadmaster for Sale to make the biker community aware of any problems that are commonly associated with the 2003 Indian Spirit or to highlight its positive features and help potential buyers make informed decisions. You might also like to take a look at this Indian Roadmaster or this Indian Spirit. I'm only asking $11,999.00 for this classy piece of machinery so if you're interested you can contact me and please remember to tell me that you found my classified ad on GoGoCycles Used Indian Motorcycles for Sale . Does it have the S&S or Powerplus engine? What size? Has there been any internal engine work done? Does it smoke or have blowby? Is it still for sale?, Would you ship to Alberta, Canada?